Essentially Punk rock,Early Clash,Ramones,Damned,Stranglers. 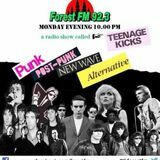 with a massive mix of UK Subs,SLF,Dead Kennedys,Angelic Upstarts,Exploited,Adicts,GBH to name a few.lover of early electro,kraftwerk,moroder,OMD,moving on to New Order Pet Shop Boys. Ska music,as well as some 70&apos;s & 80&apos;s rock and pop. Suede,Gene and Embrace from the 90&apos;s,onto now Editors,early Killers,Interpol.